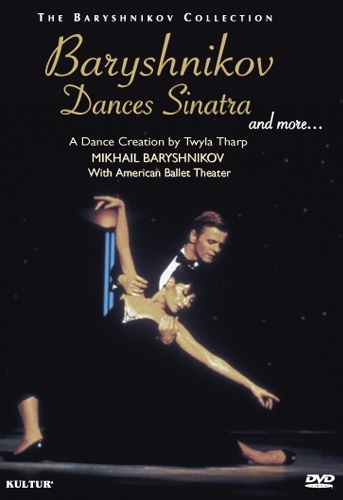 Mikhail Baryshnikov performs in three ballets full of human drama, choreographed by Twyla Tharp. In one sense, they all tell the same story -- the vitality, daring, intelligence, and emotional depth that a great dancer possesses, and a brilliant choreographer's vision of that dancer and of dance itself. The Little Ballet, to music by Alexander Glazounov, offers Baryshnikov, Deidre Carberry, and three other American Ballet Theater dancers in a sweet-tempered, fluid work that makes subtle allusions to the dreamer-hero-elusive-heroine ballets of the 19th century. In Sinatra Suite, Baryshnikov and Elaine Kudo evoke the less innocent world of Sinatra's moody, bittersweet voice-from the tender "Strangers in the Night" to the tough and contentious "That's Life." 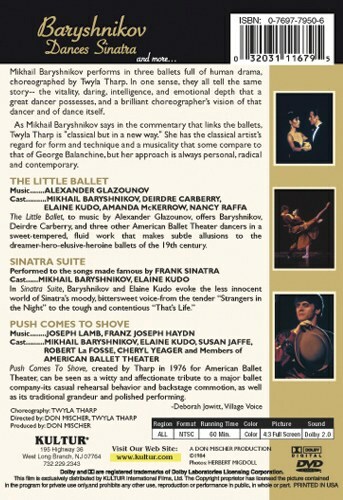 "The recording is from a live performance and is the most interesting, enjoyable and inventive work on the disk, made special by seeing Baryshnikov in his original role.There is good dancing on this DVD and it gives a fair idea of Tharp's range. A must, of course, for Baryshnikov aficionados, showing him at the height of his powers and intent on expanding his range."